First target is achieved – now push for Europe? Burnley return to action at bottom side West Brom on Saturday after hitting their first target for the season. And Clarets boss Sean Dyche is open-minded as to what his players can go on and achieve in the remainder of what has been a remarkable campaign. Burnley have set a new Premier League points best, having reached 43 with the 3-0 win at West Ham last time out. With their Premier League status secured for a third-successive season, and fourth in five, Dyche’s men lie seventh – which looks increasingly like being enough to earn Europa League qualification. Should one of semi-finalists Manchester United, Spurs or Chelsea win the Emirates FA Cup, seventh place will secure European football for the first time since reaching the quarter-finals of the Europa League and UEFA Cup’s forerunner, the Inter-Cities Fairs Cup in the 1966-67 season, when they were beaten 3-2 on aggregate by Eintracht Frankfurt in the last eight. Dyche is looking for his players to continue their good work in the remaining eight games of the season – which include pivotal games against eighth-place Leicester City and sixth-place Arsenal. He said: “The first target is complete. “I’ve spoken about development and improvement, and we got to 40 against Everton, and then to go to 43 is very pleasing, with eight to go. 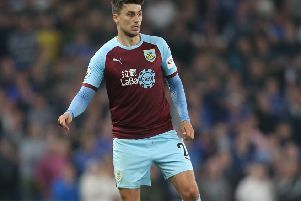 While Robbie Brady and Steven Defour are out for the season after knee surgery, Burnley have recently welcomed record signing Chris Wood back from injury, with the New Zealand skipper netting three in two substitute appearances. Left back Stephen Ward is also back after a lengthy absence with a knee problem, with captain Tom Heaton close to being available for selection again after being out since September with a dislocated shoulder. The squad was stretched during a run of 11 league games without a win, which ended with victory at Turf Moor over Everton. Burnley backed that up with the win at the London Stadium, and have now lost only one of their last six outings. Dyche feels the growing strength of the squad will be important in the remaining games. He said: “It’s not that we decided not to win in 11 games – we weren’t looking for that run. “I mentioned at the time, our squad was stretched for the first time, we had a couple of things out of our hands, and decisions went against us. “But I did feel when the injuries cleared up, the strength of the squad improved, and players see that and it gives them extra belief. “We’re coming back to what we were before the injuries. “It doesn’t guarantee anything, but gives you a better chance.